Murray Davidson hopes that reaching his goals target will help St Johnstone continue their fine form and lead to a Scotland international call. Davidson scored Saints' second in a 2-1 win over St Mirren - their fifth straight victory. "It is the first time I have set any targets for myself," who had just scored his third of the season but was keeping the total he set private. Davidson has been included in Scotland squads twice without winning a cap. He has not been called up by national coach Craig Levein since March last year and will not be involved in the squad preparing for World Cup qualifiers against Wales and Belgium. But the 24-year-old has put that in the back of his mind as he looks to help Saints rise up the Scottish Premier League. 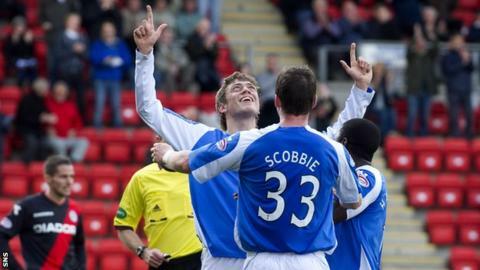 "I have got to continue my form for St Johnstone and hopefully, one day, I will get the call," he said. Davidson fired four goals in his debut season as a first-team regular at McDiarmid Park, hit the net three times the following season and four last term. "People have been getting on to me about not scoring enough, so I am looking to get more this season," said Davidson. Victory over St Mirren lifted the Perth side, who had failed to record a win in their first four games of the season, above the Paisley visitors and into fourth place. "There have been no great changes, but the results have been better," Davidson said of the form that led to Saints' Steve Lomas being named manager of the month for September. "We have a great team spirit and we need to keep believing in ourselves." Davidson thought that signs were good that his side could continue their successful run. "In the first half, we were excellent and were 2-0 up at half-time," he said. "The second half was not so good, but we ground out the result in the end and we're just delighted with another three points. "It's always good to get a result going into the international break. "The manager pointed out before the game that we only had 13 fit senior players. "We have quite a big squad, but we have six our seven out through injury of suspension and, when they come back, it can only make us stronger."